Galileo: "In this matter, it behooves all those who wish to make such observations to be forewarned. For it is necessary first that they prepare a most accurate galss that shows objects brightly, distinctly, and not veiled by any obscurity, and second that it multiply them at least four hundred times and show them twenty times closer." Sidereus Nuncius tr. Albert Van Helden, p. 38. What is a Galilean telescope? A Galilean telescope is defined as having one convex lens and one concave lens. The concave lens serves as the ocular lens, or the eyepiece, while the convex lens serves as the objective. The lens are situated on either side of a tube such that the focal point of the ocular lens is the same as the focal point for the objective lens. How does a Galilean telescope work? The Galilean telescope was innovative in that he was the first to expand the range of magnification of the new spyglasses beyond 3X, using his particular set of lenses. In Sidereus Nuncius, Galileo described how these two lenses served to magnify an object. "When there are no glasses in the tube, the rays proceed to the object FG along the straight lines ECF and EDG, but with the glasses put in they proceed along the refracted lines ECH and EDI. They are indeed squeezed together and where before, free, they were directed to the object FG, now they only grasp the part HI" Galileo, Sidereus Nuncius tr. Albert Van Helden, pp. 38-39. Actually, Galileo could not explain how his telescope magnified precisely. He did not understand, as we now know, that the magnification of his telescope can be computed by F/f (see top figure). Increasing the magnification requires lengthening the telescope. Our 10X telescope is about 4 feet long. From the above picture, you can see that an image, HI, will be viewed upright, making the Galilean telescope useful for terrestrial purposes as well as astronomical. Keplerian telescopes, in contrast, invert the image. What are the disadvantages of a Galilean telescope? 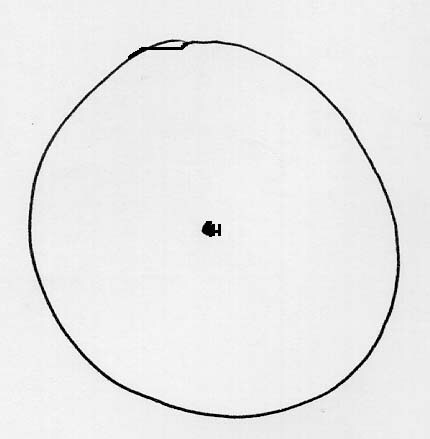 The Galilean telescope's biggest disadvantage is its small field of view. A Galilean telescope typically has a field of view of about 15-18 arc minutes. The moon has a diameter of about 30 arc minutes, so the Galilean telescope only reveals approximately one-fourth of the moon's surface at one time. In the Houston skies, a typical field of view has only one star or no stars at all. This makes it very difficult to map a constellation. Increasing the magnification on the Galilean telescope, like all telescopes, reduces the field of view. Perhaps Galileo built a 30X telescope, but it is doubtful that he used much in his observations. The field of view must have been very tiny. How do you make a Galilean telescope? This image was produced by the star jumping in the field of view. We tried to have one person hold the telescope tube steady, but it takes very little movement to cause a star to move across the field of view when the field of view is only about 15 arc minutes. Moreover, our telescope would blow over often and required one person to hold it as still as possible, but this never really worked very well. So, we built a new mounting and stars looked like this, with very little distortion. These can vary. The length is approximately equal to the height that you desire. These are used to stick into the bottom of the legs of chairs to protect the floor. They provide the foundation for the trunnions to turn. These are used for the end plates of the tube bracket assembly. They allow for the different telescopes to be used, just by unscrewing these and inserting a different telescope. A whole lot of plywood! The base is constructed by attaching the plastic holder to a square piece of plywood and then adding four legs which extend outward. The big plastic tubing can be glued into the holder. At the top of the tubing, another plastic holder is put on, but not glued, so that the entire top of the mounting can be removed for adjustments and travel purposes. The top plastic holder is attached to a round piece of plywood which has a whole cut out of the middle and a screw inserted there. The support box will be attached here and can swivel 360 degrees. The support box is constructed much like a shoe box except that one side is missing. The bottom has a rectangle cut out of end (see where Travis's hand is). This allows the bracket assembly to rotate all the way to a position perpendicular to the ground. 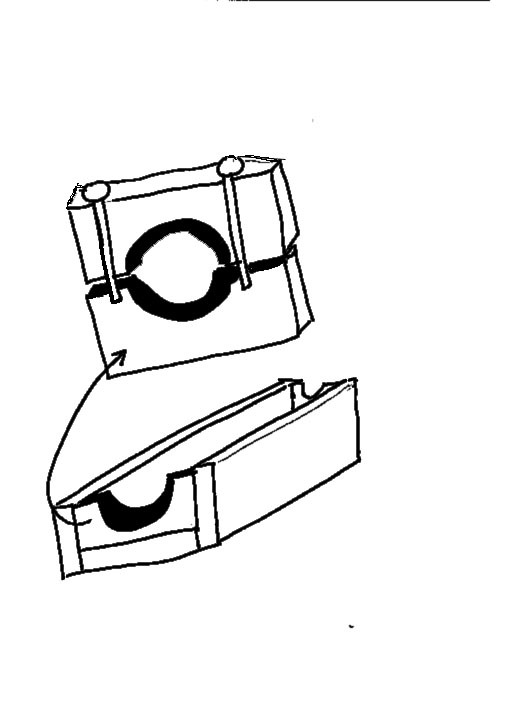 Also, on the end of the box opposite Travis, cut out a semicircle to allow the telescope to rotate all the way to a position parallel to the ground. It is made up of a rectangular three-sided box with end plates on either end (bottom). The end plates (at the top) have wing screws which allow the top half of the end plate to be removed from the tube bracket assembly, releasing the telescope. This is useful for making adjustments to the telescope itself or for using a different powered telescope in the same mounting. Notice also the round wooden pieces attached to either side of the support box in the above picture. Wood glue is applied around the circumference of the circle and the smaller plastic tubes, only about an inch in length, are squeezed on. These are the trunnions. The unique part of the mounting is the trunnion. Trunnion notch plates are attached to the insides of the left and right walls (when looking through the telescope) of the support box. Plastic Furniture tacks are stuck into the insides of the triangular cut-out and support the trunnions. These tacks can be moved at any time to increase or decrease friction so that the trunnions will move smoothly, but also not allow the tube bracket assembly (and thus the telescope) to slip. The tube bracket assembly, telescope, and support box combined can be removed from the base. The result is that our telescope moves freely through an entire hemisphere giving us the ability to look at anything in the sky. It was with this mounting that we were finally able to recreate some of Galileo's observations. If you would like more information on how to build a relatively cheap mounting for your Galilean telescope, just e-mail Tom Williams or Jessica Williams. Return to the astronomy group's home page .